TIRUMANGALAM.DEC.23: Government Homoeopathy Medical College celebrated their College day “Zen Fiesta 11” at their Auditorium. Lakshmi Priya, secretary welcomed the gathering. 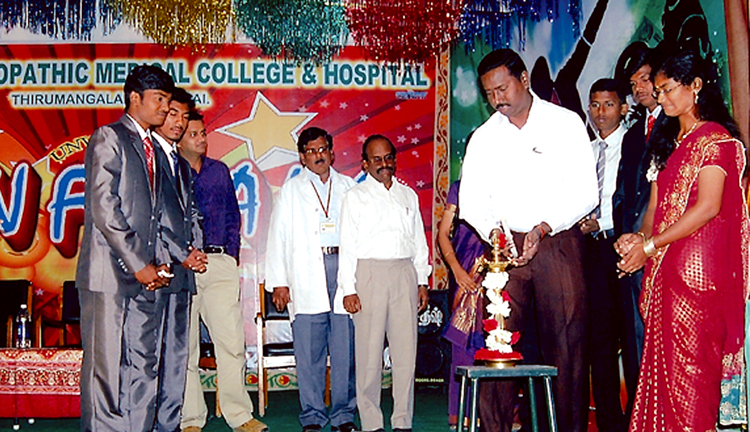 The celebration was inaugurated by the Chief Guest Thiru. Asra Garg, Superintendent of Police, Madurai District, Prof.Dr.A.Gopalakrishnan presided over the function. The students union Chairman S. Saravanan presented the annual report and prizes were distributed to all rank holders and competition winners. A cultural program was also hosted by the students .The fine arts Secretary M.Ahammed Adhil proposed vote of thanks and finally the event ended with National Anthem.